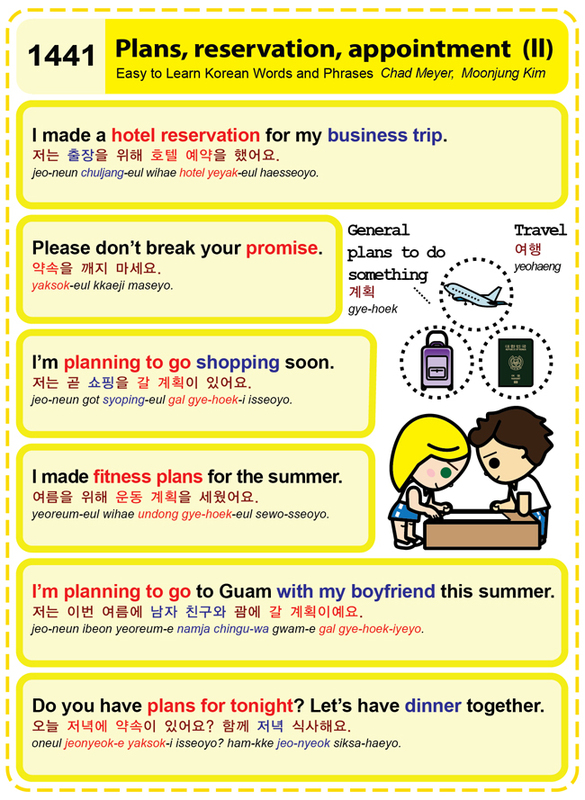 Easy to Learn Korean 1441 – Plans, reservations, and appointments (part two). This entry was posted in Series and tagged appointments, Do you have plans for tonight? Let’s have dinner together., General plans to do something, I made a hotel reservation for my business trip., I made fitness plans for the summer., I’m planning to go shopping soon., I’m planning to go to Guam with my boyfriend this summer., plans, Please don’t break your promise., reservations, yeohaeng, 계획, 약속을 깨지 마세요., 여름을 위해 운동 계획을 세웠어요., 여행, 오늘 저녁에 약속이 있어요? 함께 저녁 식사해요., 저는 곧 쇼핑을 갈 계획이 있어요., 저는 이번 여름에 남자 친구와 괌에 갈 계획이예요., 저는 출장을 위해 호텔 예약을 했어요. by easykorean. Bookmark the permalink.